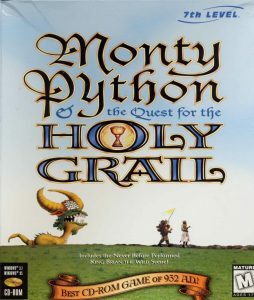 Monty Python & the Quest for the Holy Grail is an adventure game created by 7th Level in 1996 for Windows. The game is based on the 1975 film Monty Python and the Holy Grail and was the second of three Monty Python games created by 7th Level. The game’s aesthetics are a mixture of photo realistic rendering and the comic style of Terry Gilliam. The objective is to move through the world and collect a series of objects in order to cross the bridge of death. The game also contains a series of sketches and audio clips not present in the film, including an alternative reason for the minstrels’ disappearance.